Whenever I passed by Bengawan Solo, I would drool at the Tapioca Cake. There are two kinds – baked and steamed Tapioca Cakes. It is one of the easiest steam cake recipes which I personally think it is easy to make. We have always seen white and yellow Tapioca Cakes. Trying to be creative … in fact, the real reason was, I have some red sugar 红糖 at home, I decided to replace the usual white sugar with this red sugar. Surprisingly, it turns out to be beautiful and becomes a hit when I shared the picture. I believe it will entice my kids to love Tapioca Cake as well. By leaving this cake in the fridge overnight, it gives a different texture again. When I brought it out of the fridge, it is soft outside and hard inside. Personally, I prefer the kueh to be soft. Nevertheless, as there is coconut milk being added, it is best not to store for more than 2 days. To “extend” the lifespan of the grated coconut, my mum advised me to steam it with some salt. For the grated Tapioca, admittedly I am too lazy to make my own. I bought the Tapioca from the wet market and asked the uncle to grate it for me! Same for the grated coconut. The big supermarkets sell off-the-shelf grated coconut, but I prefer those freshly-grated at the wet market. Same for the coconut milk. But, if you just want a quick and easy Tapioca Cake, you can buy the off-the-shelf coconut milk. I have tried the two brands separately bought from NTUC and Cold Storage. The brand – JJW coconut milk from Cold Storage is closest to that of the freshly squeezed coconut milk as it is lighter. Comparatively, the one from NTUC is of much thicker texture. 1. Boil the water for the steamer. 2. Grease the 7″ aluminium tin. 3. Mix the grated tapioca with coconut milk and red sugar. I use a whisk to mix it well. 4. Pour the mixture into the tin. 5. Steam under medium-high heat for 35 minutes. 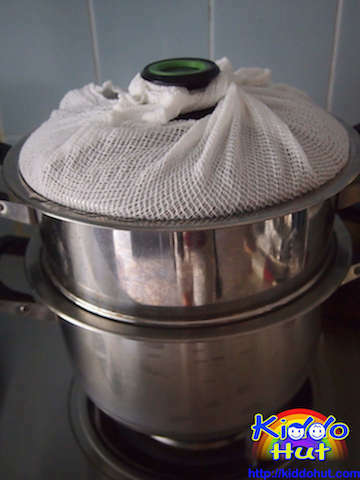 Preferably, put a steam cloth above to ensure water doesn’t condensed into the cake. 6. Let it cool, cut it with a lightly greased knife. 7. Mix the grated coconut and salt together, and steam for 5 minutes. 8. 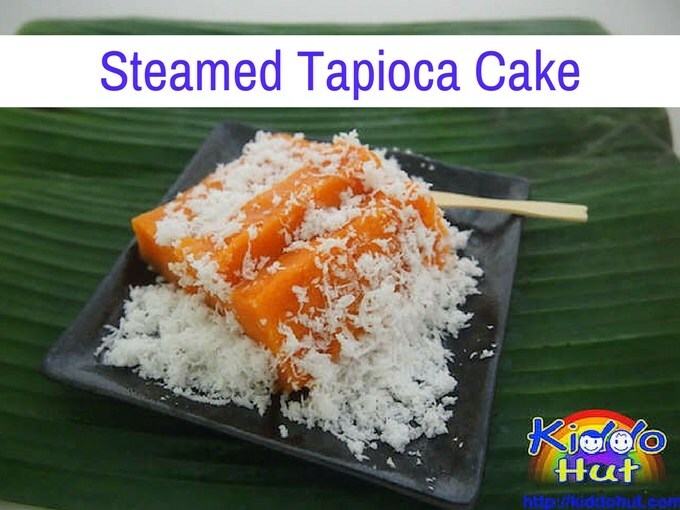 Put some steamed grated coconut on the tapioca cake and serve.